is sanctuary located near Slatine on south side of Ciovo Island between steep rocks just above the sea. It has been built almost 5 centuries ago. Sanctuary and the curch of Our Lady of Prizdinica has been developed by preiests from Poljica republic in 16 century. The priest Juraj Stoidražić came into this wilderness and built this temple in honor of the Immaculate Conception of the Virgin Mary in 1546. There is an exceptional view from the sight, calm nature and very interesting arhitecture. It can be also aproached from the sea by boat, or from the road from Slatine. The villa is situated in Racetinovac bay (Pantera). Very religious family Racettin has built the villa and small church dedicated to Saint Antun the Hermit in 1630 year. There are also more small very old churches which are interesting to see in Ciovo; Franciscan convent of St. Anthony, church odf St. Nicholas (XIV century), St. Andrew, St. Peter, Early Romanesque Church of Our Lady, situated by the sea, with Renaissance supplements, Dominican convent of St. Cross, founded in XV century in Arbanija, etc. 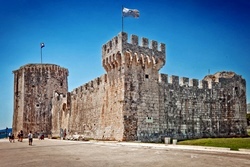 Trogir - the city museum, beautiful mediaval city, with its charm, it will take you back to the past times. It is considered to be the best preserved romanic-gotic city in the central Europe, and has been under protection of UNESCO. By all means, visit Cathedral, City hall and Kamerlengo castle. 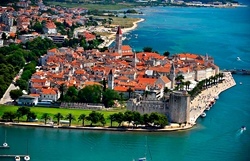 The city of Trogir has been founded by Greek colonists from the Island of Vis in the III century B.C. The most important cultural monument is the Trogir cathedral, specially the portal of west gate, the work of master Radovan. 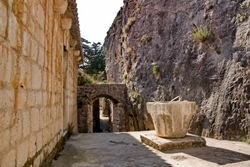 The visitors of Trogir were always fascinated with its historical monuments, small streets and works of art (Kairo), with numerous masterpieces. The city of Trogir is situated on the west coast of Kastela bay, on the island between Ciovo and the land, conected with mainland by stone bridge. For a full 17 centuries continues the saga of Split, since the Roman emperor Diocletian decided to build his palace exactly on the peninsula near the big Roman city Salona, in order to spend his last years in peace. In these 1700 years, the palace has been slowly becoming a city, which today atracts visitors by its reach tradition, glorious history, and the beauty of cultural heritage and nature. Split is the best example how the mediteranean way of life can be preserved in a modern city, and enyoj in its "slow living" advantages. Diocletian palace and the whole old historical city center are part of the UNESCO preserved cultural heritage since 1979 not only because the palace is greatly preserved, but because there is a life going on in the palace in its fullest. In this structure there are visible hiistorical signs of the old Rome, through middle ages till now. Walking through the old cityy it is possible to travel trough time, there are views of extraordinary examples of ancient arhitecture like Peristil, mediaval Romanic churches, gotical palaces, renesane portals of noblemens houses, baroque fasades, all the way to modern arhitecture.